The discovery of a gene defect that causes leukemia in children with Down syndrome may speed diagnosis and provide a new target for therapy. John Crispino of the Ben May Institute for Cancer Research and Michelle Le Beau, professor of hematology/oncology, reported their team's discovery and its implications in the August 12 advanced online Nature Genetics. Children with Down syndrome are 10 to 20 times more likely than other children to develop leukemia-usually the rare acute megakaryoblastic leukemia (AMKL) form. When the researchers compared DNA from 75 leukemia patients and 21 healthy people, they found that all six patients with Down syndrome and AMKL had an altered GATA1 gene. The other patients' genes were not mutated. A paradise tree snake after take-off. They don't have wings, but they do fly. 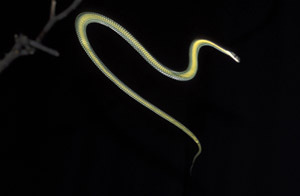 To move between tree branches and the ground, flying snakes of Southeast Asia coil the front of their bodies into a "J" shape, jump up and away, then flatten out to provide lift and stability, Jake Socha, a graduate student in organismal biology & anatomy, reported in the August 8 Nature. Then the snake shimmies in a side-to-side "S" shape, flying like a sidewinder moves. "I can't think of anything else that moves this way in the air," says Socha, who has videotaped more than 1,000 snake flights over six years. In the 100 or so years since the first published reports of flying snakes, Socha's is only the second detailed study. Chicago researchers have combined cancer chemotherapy with a type of gene therapy that stops tumors from growing new blood vessels and thus limits the growth of the tumor. Tested in mice, the combination is far more effective than standard chemotherapy and has no added side effects. Derived from a similar approach combining gene therapy with radiation, the new method "not only enables us to target the original tumor but also potentially to aim at the small clusters of cancer cells that may have spread to distant sites," says Ralph Weichselbaum, the Daniel K. Ludwig professor and radiation oncology chair, who directed the study, which appeared in the August Journal of Clinical Investigation. Surviving five great mass extinctions doesn't guarantee an organism evolutionary success, geophysical-sciences professor David Jablonski wrote in the June 11 Proceedings of the National Academy of Sciences. In a global analysis of marine fossils at the genus level, Jablonski found 10 to 20 percent of lineages that survived the five largest mass extinctions in Earth's history proceeded to die off in the next 5 million or 10 million years-a significantly higher amount than die off during stable periods. This extinction ripple divides the survivors into "winners and losers," Jablonski says. Taking his cue from a 1995 movie, Jablonski dubbed the last representatives of their clades-groups of organisms including an ancestor and all of its descendants-"dead clades walking." The oral medications most widely used to lower blood-sugar levels in patients with type 2 diabetes are likely to increase the risk of coronary-artery spasms. A Chicago research team, led by assistant professor in cardiology Elizabeth McNally, reported its findings in the July 15 Journal of Clinical Investigation. The study focused on mice with a genetic defect that duplicates the actions of sulfonylurea drugs. The drugs, the researchers found, constrict arteries and therefore increase blood pressure and decrease blood flow to the heart, causing chest pain and even sudden death.